Tattoo gloves are an instrumental piece of equipment required to be worn by all tattoo artists. 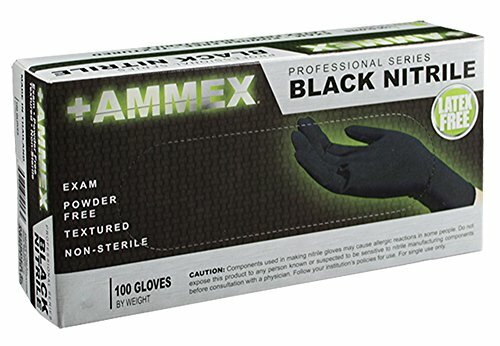 These gloves not only keep an artist’s hands clean from ink but also ensure proper hygiene and stop any possible infection from entering a client’s skin while tattooing. Why Do Tattoo Artists Use Black Gloves? What are the Different Types of Gloves for Tattooing Artists? How Should a Pair Fit? These gloves are perfect for clients with a latex allergy and are powder-free which are great for artists with sensitive skin. The gloves also come in a box of 100, which will get you through weeks of tattooing without needing to buy more. For cleaning up ink and spills around the tattoo parlor the gloves are chemical resistant meaning ​there is less chance of facing side effects of dangerous chemicals. These gloves come in sizes small to extra large to ​complement any sized hand. Overall a great buy for the money. 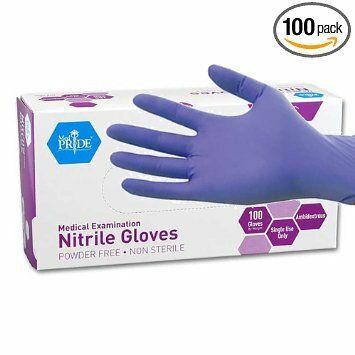 These gloves run in a large and offer ​excellent protection from chemicals, ink, or anything else you may find yourself dealing with at work. With a unique beaded pattern on the cuff of the gloves, forget the annoyance of gloves rolling down your hand. Also, this company instituted a more comfortable fit making it perfect for hours of use. For those artists with sensitive skin or latex allergies, the great news is that these gloves are latex-free. If you ever find it hard to grip onto objects in gloves at work, this product has textured grips in the fingertips to help you throughout the day. These gloves come in a variety of shapes and sizes for a variety of skilled tattoo artists. Their rubber latex is naturally made preventing in any allergies or skin reactions at work and offer a great deal of protection. They also ​provide a greater sense of comfort and have built-in texture to make it easier to grip onto different objects. For those artists who find their hands covered in ink every day, look no further since these are puncture resistance and will not leave any residue on your hands. 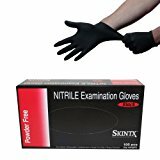 Finally, the SKINTX gloves are powder-free meaning less chance of infection. These gloves are not only latex free but have gotten some high fives from the most recognized tattoo artists. The black color not only looks great but matches the ink you would use on a day to day basis. They also offer excellent fit and flex, perfect for any hand or finger size. As with any great tattoo glove, they also offer an excellent sense of grip when holding a pen or a wet brush. All in all, a great pair of gloves from a well-recognized brand. The MedPride gloves are one the best budget gloves a tattoo artist can buy. Perfect for any job, spill, or honestly anything you can think of. It is made out of a unique material that flexes to the shape of your hand and provides a safe and sanitary fit. They are also made from ​a synthetic polymer which is great for those people who are allergic to latex. They also offer durable grips so nothing slips out of your hands during the workday. You may be wondering about their strange color, but it was a ​smart idea from the company, making it easier to spot any rips or tears that could cause skin infections. What points should you consider when looking for a good pair of artist gloves for tattooing? Gloves should be resistant to rips and punctures. You want your gloves to be made of a strong material to reduce the chance of infection. Your glove should fit snugly and not limit any hand movement. A proper fitting glove will allow artists to work freely and safely. As some tattooing sessions can last a long time, sometimes hours on end, ​ensuring you'​ve purchased a pair that are comfortable on your hands is of the utmost importance. ​The last thing you need when doing a detailed tattoo is the feeling that your hands are ​impaired due to poor quality gloves. As we've discussed ​below, there are three different types of tattoo gloves. 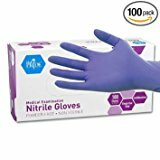 Latex gloves are the most common, but it is good to have some nitrile gloves on hand as well in case someone has an allergic reaction or has sensitive skin. Some cheap gloves you find on the market ​can contain some nasty che​micals in them that are not ideal for people with allergies or sensitive skin. Make sure that the manufacturer clearly states no chemicals are present in their gloves before ​purchasing. The affordability of the gloves can be a serious factor ​if you will need to continually buy a lot of them. If you're a professional tattoo artist, then you ​may be running on a tight budget when it comes to purchasing equipment or materials, in which case you'll want to make sure that you're buying a pack of gloves that offer value for money. As the name suggests, tattoo gloves are disposable gloves that must be worn by tattoo artists while they are working. These gloves help to keep the whole process hygienic for both the artist and the client. They also help to prevent the spread of infection. Tattoos are basically open wounds, which leaves them very susceptible to infection and irritation. Tattoo gloves are basically medical grade examination gloves. These gloves should be durable, thick, and comfortable. Tattoo gloves should also be disposable, as you will need to change them often. These gloves are required for the health and safety of everybody involved in the tattooing process. They protect your client from potential infection. They also protect you against any bodily fluid, blood, and blood-borne pathogen you may encounter while tattooing and keep you safe from infection as well. 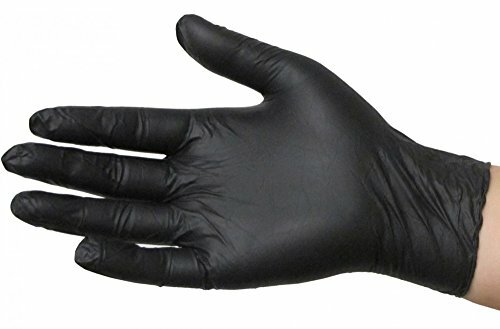 A set of these disposable gloves must be worn during every step of the tattooing process. This includes cleaning your station, tattooing your client, and cleaning the tattoo when it is done being applied. If you touch anything that is not your equipment or your client’s skin during the entire process, you must put on a new pair of gloves. This will eliminate the risk of contamination and keep you and your client safe. We touched on it a little above, but the main reason that tattoo artists must wear gloves is safety. Your gloves are the first line of defense between you and infection. There are many health risks when it comes to tattooing. Since tattooing directly involves both skin and bodily fluids, there is a high-risk factor for artists to contract viruses, bloodborne pathogens, and infections. However, if the proper practices and procedures are followed, tattooing can be very safe for all involved. The CDC and OSHA have created guidelines that tattoo and piercing artists must follow. These are called the Universal or Standard Precautions guidelines and by law, they must be followed. Among other things, these guidelines clearly state that employees who are exposed to health and safety hazards should wear protective equipment like gloves. This will prevent the transmission of diseases and create a safe work environment. Before putting on your gloves, be sure to wash your hands thoroughly. Also be sure to search for and bandage up any cuts, scrapes, or abrasions you may find. After you put your gloves on, try not to touch surfaces that may be contaminated. This includes telephones, money, and any other germ covered surfaces. If you absolutely must answer the phone during a tattoo session or leave for any other reason, you should wash your hands again and put on a new pair of gloves. Latex gloves are a great choice for tattoo artists. They are fairly strong and protect against cuts and punctures. Latex gloves also provide a great amount of stretch so that they will fit comfortably on any artist's hands. These gloves also allow the artists to remain in control without losing any sensitivity. Be sure to speak to your client before you don any latex gloves, as latex is a pretty common allergy. Nitrile is a synthetic latex material. These gloves are relatively similar to the latex in terms of comfort, sensitivity, and control. You start to see a real difference when you look at the durability. These gloves are a lot stronger and will not tear or rip as easily. Additionally, these gloves cause less allergic reactions than the latex ones. The nitrile is a perfect alternative should a client with a latex allergy come in. Vinyl gloves are the most durable. They are resistant to chemicals, solvents, greases, and oils. This makes them ideal for cleaning, but not a good choice for tattooing. This is mainly due to the lack of sensation and control you have when wearing these gloves. One of the biggest questions that may have crossed your mind is, how should my tattoo glove fit? Is it too tight? Is it too loose? Am I going to rip it? Luckily most tattoo gloves are strong enough to prevent any tearing, but it’s better to go over how exactly your glove should fit your hand. ​Finding a good pair of tattooing gloves should not be a difficult task. As mentioned above, there are some things you need to consider first such as the ​fit, color, and comfortability when purchasing. But, ​there really isn't alot between the makes we've listed above as they're all quality. Just make sure your chosen pair will fit your hands and ​are comfortable to wear, aswell as ​considering the price difference between each pair. Now your hands are ​protected, it's time to get inking!